Black Friday helped to propel retail sales 1.6% higher in November from a year earlier, official figures suggest. The Office for National Statistics (ONS) said that retailers had reported a particular uplift in sales of electrical household appliances. ONS statistician Rhian Murphy said underlying growth remained "reasonably strong". 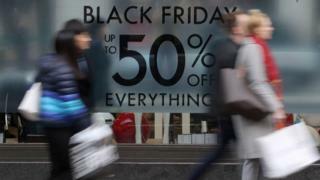 However, analysts said that Black Friday had distorted sales and retailers faced challenging conditions. The ONS said that the quantity of food bought in November fell by 0.1% compared to the same month last year. However, the amount of money spent jumped by 3.5%, reflecting a rise in food prices that has contributed to the increase in inflation, which is now at a near six-year high of 3.1%. In non-food sales, clothing and footwear rebounded from a slump in October to rise 2.3% in November from a year earlier. Department stores, however, saw their sales fall by 0.9% which the ONS said "continues a recent pattern of slowdown in this sector". Alex Marsh, managing director of Close Brothers Retail Finance, said: "The final run up to Christmas may prove more difficult than usual for retailers as they battle low consumer confidence amid increasing inflation and a squeeze on wages." Black Friday is an import from the US, where it takes place on the day after Thanksgiving and is regarded as the start of the Christmas shopping period. Samuel Tombs, chief UK economist at Pantheon Macroeconomics, said: "The surge in retail sales in November does not signal broader consumer strength." Mr Tombs said Black Friday meant the strength in November retail sales "merely reflected people bringing forward purchases that they otherwise would have made in December or January to November, due to the discounts available". Month-on-month, sales rose by 1.1% in November from October, which was ahead of analysts' forecasts for 0.4% growth. Ian Geddes, head of retail at Deloitte, said that "on the surface" the data was "promising". But he said: "The next 10 days of pre-Christmas sales will be crucial for retailers. Trading is likely to peak on Friday 22 December, particularly for purchases of food and drink as consumers prepare for festive hosting. "However, profitability is another matter and margins are under intense pressure."